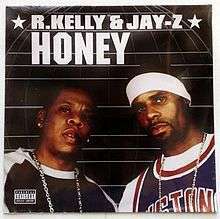 "Honey" is a 2002 song by R&B singer R. Kelly and rapper Jay-Z. It was also co-written by the song producers, Poke and Tone. It was released in late 2002 as the first single from The Best of Both Worlds. It peaked at number 109 on the Billboard Hot R&B/Hip-Hop Songs. The song charted at number 35 on the UK singles chart and 84 on the Australian singles chart. There is no music video for this song.